Many times when planning a big trip overseas one very important need is overlooked. Whether you have a passport, Visa or need a renewal. When this happens it is oftentimes discovered with just weeks or days to solve the problem. 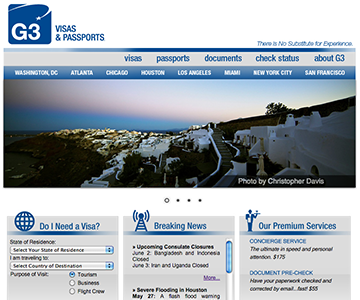 G3 Visas can assist you when this happens. They will take all of your submission documents, be sure you have complete information and process through the right channels.. They can have your visa, your passport or similar type of necessary travel document for you in as little as one to two business days thanks to their expedited travel document processing services and team of knowledgeable representatives.